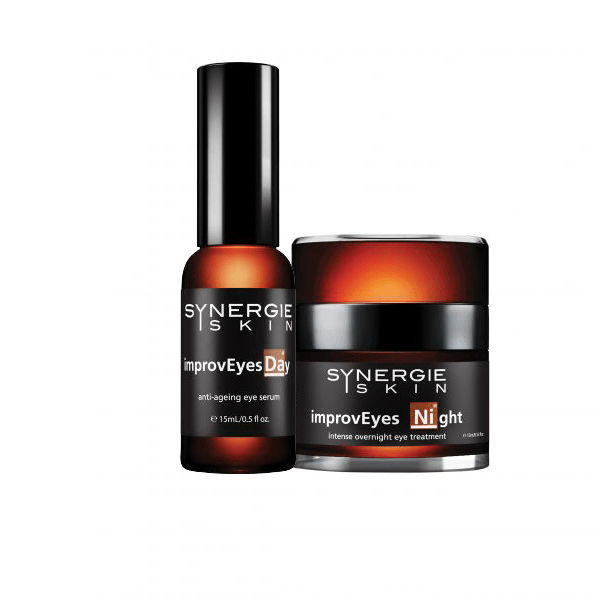 Includes Improve Eyes Day & Improve Eyes Night. Anti-ageing eye serums with advanced peptide technology. A lightweight eye serum designed to restore the youthful appearance to the delicate skin around the eye area. Revolutionary peptide technology addresses fine lines, crow’s feet, dark circles and puffiness. Green coffee extract assists in fighting free radicals and pure hyaluronic acid provides intense hydration to nourish the eye area. Acetyl Tetrapeptide-5 – a ground-breaking peptide complex proven to improve blood and lymph circulation, elasticity and hydration in the eye area, decreasing in dark circles and puffiness. Acetyl Octapeptide-3 – a muscle relaxant peptide which helps to reduce expression wrinkles (crow’s feet and frown lines). Hyaluronic Acid – can bind water up to 1000 times its volume, resulting in plump skin and a reduction in the appearance of fine lines and wrinkles. Green Coffee Extract – 10 times more potent than green tea as an antioxidant. This extract neutralises free radicals created by environmental toxins and UV light, preventing wrinkles and reducing the appearance of other cell damage around the eyes. Beta Glucan- This ingredient has also been shown to stimulate collagen and reduce fine lines. It also acts as an anti-irritant and aids wound healing. Saccharide Isomerate – an exopolysaccharide to enhance internal hydration to the delicate eye area, reducing the appearance of lines and wrinkles. This ingredient stimulates the dermal fibroblasts to make its own natural hyaluronic acid to plump and hydrate from deep within. Sodium PCA- a powerful skin hydrator that is naturally occurring in human skin and declines with age. It is known as a humectant and works to bind water molecules to the skin. Sodium PCA has also been shown to protect the natural acid mantle of the skin and protect from inflammation. Shake well before use. Apply sparingly in patting motion to upper and lower eyelids in the morning using fourth finger.